Salmond resignation speech Jump to media player Scotland's First Minister Alex Salmond announces he will step down following defeat in Scotland's Independence Referendum. 'Triumph for the democratic process' Jump to media player Scotland's First Minister Alex Salmond has said the referendum campaign has been a "triumph" for the democratic process and participation in politics. Salmond: 'Opportunity of a lifetime' Jump to media player First minister Alex Salmond has been speaking on the stage of the final Yes rally at Perth Concert Hall. 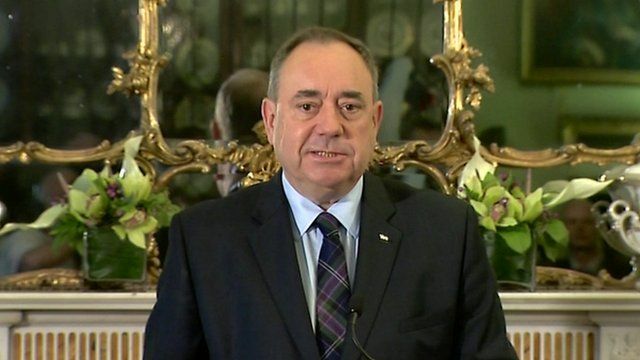 Scottish First Minister Alex Salmond says he intends to stand down, after losing the independence vote. He said it had been "the privilege of my life to serve as First Minister". "For me as leader my time is nearly over. But for Scotland, the campaign continues and the dream shall never die," he said.